The Pacproinc® cheese interleavers / underleavers can save you time and money. Not only do they cut down on overhead costs, but they also increase sanitary food service production, reduce workplace injuries and solve labor reliability and staffing issues. With our interleaving / underleaving technology, packaging and production of cheese products is second to none. Our automated technology places a piece of paper, plastic film, or foil between, under, or around cheese precisely and at high speeds every single time. Plus, the streamlined design incorporates a programmable controller and reliable motion control technology, which ensures simple to operate, low maintenance automation and a long machine life. With compact designs available, our products also save floor space and allow for food service manufacturing automation in almost any size environment. The first machines of their kind, our products offer a more environmentally friendly solution at a comparatively low cost for foodservice packaging solutions. Our solutions are pre-programmed to wrap or separate cheese at a speed of up to 600 portions per minute. Additionally, our auto-stackers allow for hands-free counting and stacking prior to getting packaged by the packaging or wrapping machine—which means better food safety and improved final presentation for your bottom line. Pacproinc® solutions are designed to be the most hygienic and quick to clean systems available. They are built specifically for harsh wash-down food environments. They feature rugged, stainless steel construction and humidity controlled, fully gasketed enclosures. These features reduce cleaning time, increase uptime, and enhance the safety of your cheese products for food service. Stand-off mounted features prevent the trapping of cheese product scrap to enhance cleanliness. Control cabinets and enclosures have sheet metal breaks, eliminating the possibility of standing water on flat surfaces. Sealed stainless steel bearings in all food-contact areas prevent product contamination. All machines are available with casters or leveling pads to meet your plant’s individual requirements. Trays keep product scraps out of the paper path, as well as paper tails off the floor, preventing material contamination. If you don’t need interleaving, that’s not a problem. We also offer counter and stacker machines that fit any application. High-speed, sanitary, hands-free counting and auto-stacking guarantees more accurate stacks for simpler packaging and improved presentation. The PLC design enables easy production setup and customizes parameters, such as stack count, delay, speed, and portion thickness. Pacproinc®’s technology melds seamlessly with other equipment to interface with specific production requirements. Counting and auto-stacking decreases labor and training expenses, plus it lowers repetitive-motion injuries. Pacproinc® solutions are state-of-the-art machines that proficiently stack and interleave (underleave)—or place material between—cheese products at impressive speeds. The automated system is customized to your exact needs and can cut paper, plastic film, or foil of necessary thickness directly from roll stack, placing them beneath or between pieces or portions of cheese. They also have the capability to fully wrap the cheese portion, with paper on the top and bottom. Standard operating widths range from 3 to 26 inches and can be configured for single lane, multiple lanes, or unique groupings. 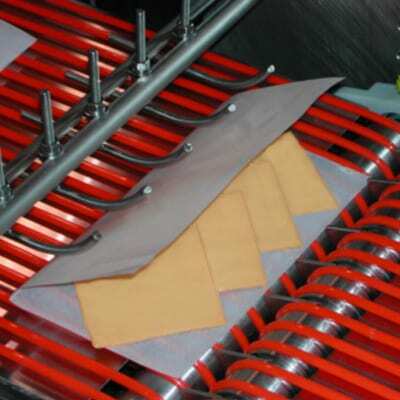 Pacproinc® cheese interleaving technology can give you a cutting edge advantage.